As promised earlier this year when Skatter Tech 3.0 made its debut, we are finally offering streamlined mobile interface for smart phones. Rather than going with a standardized mobile template, we now offer a fully custom lightweight HTML5 interface for accessing Skatter Tech from anywhere. The new touch iteration is essentially a miniature version of our publication, but it retails familiar elements such as the navigation menu bar, color scheme, and layout. For those wondering, you will not need to deal with special URLs to get to Skatter Tech Touch. 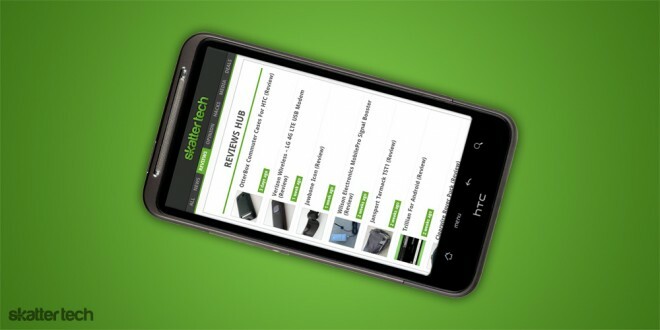 Just visit skatter.com on your mobile device as you would on your computer and our servers will automatically send you to a perfectly optimized version of our website. Easy huh? For those who still use feature phones, Skatter Tech Lite has some new enhancements. In addition to performance improvements, we added support for all sorts of old school devices including the Danger Sidekick, LG enV series, Sony Ericsson phones, HP PocketPC, Kyocera handsets, Motorola flip phones, Nintendo DS, PlayStation Portable, Nokia candy bar phones, Palm organizers, and Samsung phones. This version lacks some features, but it offers quick access to what matters most: articles. We hope to offer a consistent and quality experience that truly complements Skatter Tech 3.0. We tested the touch enabled version with Android and iOS devices without any issues, however we would appreciate any feedback from BlackBerry, Maemo, webOS, and Windows Phone 7 owners. If you run into any issues or your device does not properly forward to Skatter Tech Touch, please let us know. If you have a feature phone, please feel free to share you experiences with the lite version as well. BB Bold 9000, looks great, nice and clean. Awesome, thanks for testing it out! Do you want a brand new BlackBerry case with a clip holster? We got a sample unit we are looking to get off our hands. Shoot us an email on the contact form with your address if you want it.